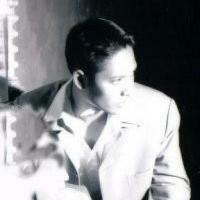 Let me introduce all of you to fellow guppy breeder Alvin Ho from Singapore. 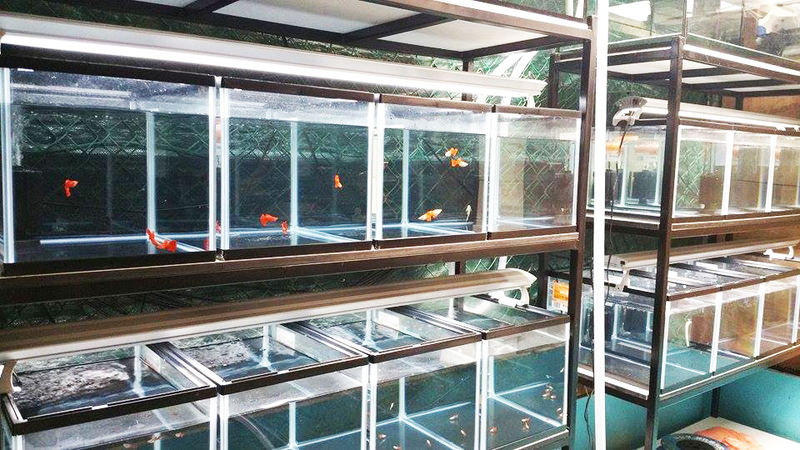 He is an avid fish enthusiast and has experience breeding Discus, Bettas and gold fishes besides his current pursuit of breeding guppies. 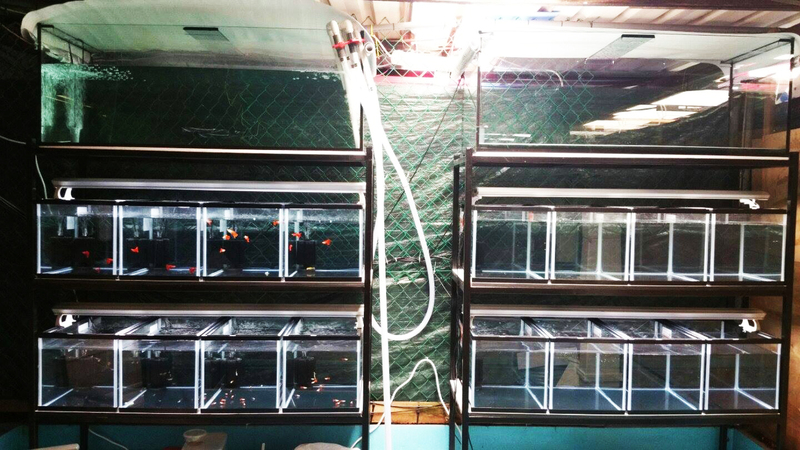 Below are some of the pictures of his guppies and the ensuing interview questions and answers that he has provided with the intention of helping all of us become better guppy breeders. Above: Side view of Alvin’s guppy breeding setup. Above: Frontal view of Alvin’s guppy breeding setup. 1) Can you introduce yourself. How long have you been breeding Guppies? I’m really considered a novice dabbling in guppies, as I have only worked on 3 separate strains thus far (Albino full reds, Wild reds and Blonde reds). Although I have been in the guppy hobby for the past 3 years, I still find myself learning new stuff every time I pick up a conversation with a fellow hobbyist. 2) Which is your favorite Guppy strain and why? As evidenced in the strains that I am currently keeping, my interest lies in solid red strains. My dream goal is to produce an albino full red line with 100% red colour coverage (yes, including that elusive colour on the abdomen area! ), and with massive dorsal proportions. You could say that my dream guppy has had many influences from my previous years’ experience in keeping show Bettas and Discus over the past years. Extreme finnage forms and purity of colour, combined with an understanding of fish genetics have always captivated me since young. 3) What are the criteria you have when selecting guppies use for breeding? Basically, it boils down to deportment, finnage and colour for me. However, (in my humble opinion) understanding the genetic background of your guppy lines also provides you with an edge above those who just breed fish using external traits. 4) Can you share your guppy breeding technique that helps you produce beautiful guppies.I prefer to keep my guppy keeping hobby simple. 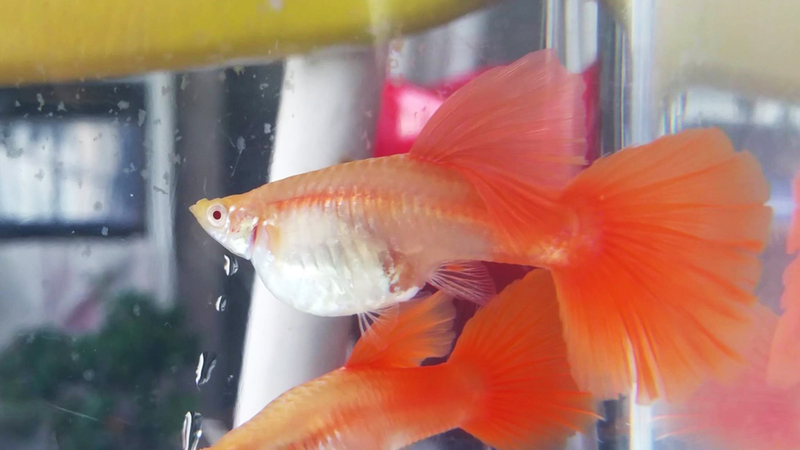 Providing good water, and having a good feeding regimen goes a long way, and that’s just what I do for my guppies.5) In your opinion which strain of guppies are the easiest to rear and which are the hardest? I believe that each and every one of the available strain of guppies have their own challenges in maintaining the lines. As I have only dabbled with a few strains, I cannot say for sure which is the hardest and which is the easiest to maintain/keep. 5) What do you feed your fishes and how often do you feed them? Tubifex worms (live), bbs, and a good pellet food. For young fish, I feed small amounts throughout the entire day AND night, up till right before the lights goes off. Older fish (3 months and up) get a minimum of three feedings a day. Protein, protein, protein! 6) Are you breeding your own particular line of Guppies? I had to start off somewhere, so I went after the best available pairs I could get my hands on right at the start. My original breeders came from Taiwan, and over the past 3 years, I have expanded my lines to include crosses to “new bloodlines” from other Taiwanese sources, as well as keeping the original line I purchased still going unadulterated. I currently am in over my head with maintaining all the different lines I now have! 7) If yes, what are the kind of efforts needed to establish and grow your own line of guppies? (You can provide answers related to in time required, human resources and technologies to reach a self-made line). What do you think about the fish keeping culture in your country and in also specifically guppy keeping? You need to have an idea of what your ideal guppy looks like, and then work towards it over time. With regards to achieving what I envision as the ultimate full red guppy line, I am currently keeping 3 strains of red guppies, with each strain having at least 1 or more distinct lines going! So to answer the question, you will need a good setup, and a meticulous and well thought out breeding plan. In terms of the guppy keeping culture in Singapore, I believe we are still learning and picking up the skills and techniques from our neighbours, especially from Thailand and Taiwan. The guppy standards are progressively getting better over here, and I am truly looking forward to see how we go from here in a few years’ time. 8) Is there any guppy breeder or breeders from whom you get inspiration from? Many! Most notably though, I absolutely love the guppies raised by a famed Taiwanese breeder, YS (鄭宇宸). 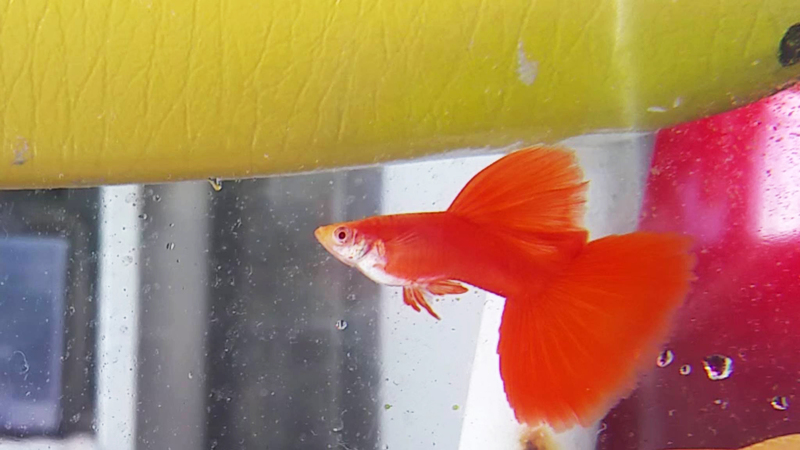 9) From your experience what are the most common problems faced by a guppy breeder? Getting the basics right. Water and food (i.e feeding the fish right)!11) This will be the last question: What advise would you give to a guppy hobbyist just staring out in guppy breeding? Once you have managed to get the basics right, start off with the best available fish you can afford out of your pocket. If you plan to work on raising show guppies by starting off with feeder fish guppies, no one’s stopping you, but I guess we will see you in about 20 generations or more down the road *cough cough*. 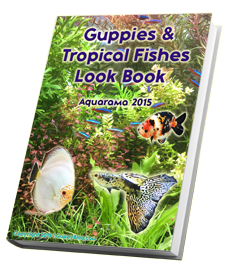 The aim is to start off as close to the current top quality of guppies available as possible, budget willing of course.